Once a mouse who lived in a big town visited his friend mouse who was living in a nearby small village. The village mouse was very excited about his friend's visit. He took him all around the village to show him the green paddy fields, the fruits, the water pond, the village temple, etc. But the town mouse was not very much excited about any of these, instead he said, "Dear friend, isn't life so boring in this village? You should once come to my town to see the exciting life there." 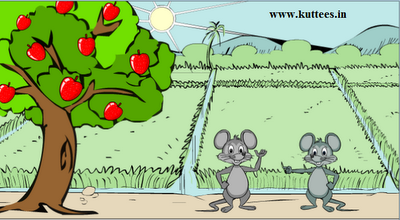 The village mouse got eager to know about the life in the town. So he went along with the town mouse to the big town. The town was much bigger than what the village mouse had imagined. He saw the big vehicles, tall buildings and the people with big surprise. That night, the town mouse arranged for a fantastic feast for his new guest. The village mouse was surprised to see the variety of food that was served in the food. He thought to himself that, even he should shift to that town very soon. Just when the two friends, started to eat, a big cat jumped inside through the window, frightened the two mice and then grabbed the food from the plate. The village mouse was terrified about what happened then. This continued for several days. Every time the two rats would sit down for food, the big cat would jump in and grab their food. One day, the village mouse thought about his previous village life. Even if it was not that much attractive like the city life, he always had peaceful mind there. So he decided to go back to his village. Moral : East or West, Home is the Best.